Posting interesting, engaging and eye catching content on social media, on the right channels at the right time, is an extensive and hugely time consuming job. Luckily, this is something that can now be automated. There are numerous WordPress plugins and solutions available that will automatically post your content out on social media. In this article we will discuss what is available, look at what they each offer, how easy they are to use and help you choose the best option for you. NextScripts is an impressive free WordPress plugin, allowing you to automatically post onto a large number of social media sites. Once you’ve published a new article, the entire post or an excerpt is automatically posted on the social media channels of your choice. Posts are customizable and can be altered for each network accordingly, giving you flexibility over what is shared out to your followers. Posts can also be displayed on business, community and group pages, enabling you to reach your audience on all different platforms. NextScripts provides a Pro version of their plugin, which is definitely worth considering if you are trying to grow a social empire. This allows you to schedule or delay posting, as well as auto reposting existing posts. This means your business can build a constant presence on social media, continuously posting at all times of the day, without you actually having to be online. If you are a large business with numerous pieces of content being created and published daily, then CoSchedule is the solution for you. 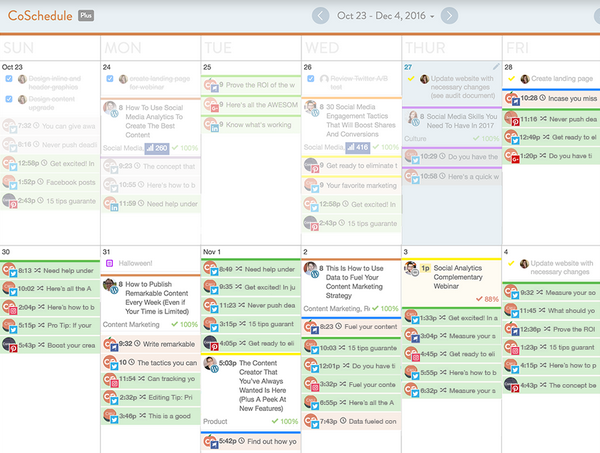 CoSchedule allows you to plan, promote and execute your social strategy all from one place. Use the drag and drop calendar to visually organise what articles are being posted when. Pre-made templates enable you to schedule up to 60+ social messages, and Best Time Scheduling allows you to understand and post at the ‘best time’ for your audience. CoSchedule also uses ReQueue technology. ReQueue fills the gaps of your daily social media schedule automatically, reusing old posts. This helps give content a longer lifespan, instead of it just getting buried under a constant social media stream of messages. It also lets you maintain a constant presence online, engaging with your followers day and night. Buffer allows you to select posts to share, and then shares your content throughout the day. The premium version of Buffer provides a social media calendar to let you easily manage all your social media accounts. You can schedule up to 100 posts at one time and post to 10 different social profiles. WordPress to Buffer is a free plugin. It enables you to set up automatic posting from your WordPress site to your Buffer account for automatic posting. This saves you the hassle of scheduling the posts on Buffer. WordPress to Buffer Pro has some very advanced scheduling features, letting you customize and schedule your messages exactly to your specifications. It also gives you access to a wider selection of social media sites, like Instagram and Pinterest. Publicize is one of the many options offered by Jetpack. Publicize allows you to share your content directly from your WordPress site on Facebook, Twitter, LinkedIn, Tumblr, Path and Google+. The settings for Publicize are very quick to set up, and all within your WordPress dashboard. Once completed, every time you publish a new post, your content will be automatically sent to the social media channels you have chosen. This is a great free and easy way to automate your social sharing, although it may not suit those who are looking to post on a wider selection of channels. Revive Old Post allows you to post to Facebook, Twitter and LinkedIn. Not only does it automatically share your new content from your WordPress sites to your social media channels, but it also automatically shares your old posts. This is an effective way to keep your content alive and maintain a presence on social media by adding interesting and relevant posts. However, it is only if you upgrade to the pro version that your social media messages will include images. Revive Old Post Pro also allows you to post to Xing and Tumblr and track your analytics, so you can see what content is popular with your audience. MicroBlog Poster lets you automatically post new and old posts to a variety of social media channels. New blog posts, pages and custom post types can be auto published from your WordPress site to your social media accounts. Or auto re-publish old blog posts to help keep engagement high on social media. With customizations available to settings, MicroBlog Poster is a great free option for those on a budget. 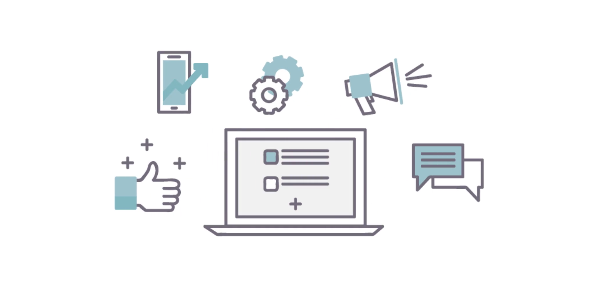 All of the above plugins and tools are great options to help automate social sharing. Before selecting a plugin, check that it allows you to post to the social media sites of your choice. Then look closely at the features to see that they fit with what you need. There are some very effective free plugins available, so if you have a tight budget you should opt for one of these. However, if you want to really want to save time and fully automate your social media, then it is worth upgrading to a premium solution. Don’t forget that even if all your content promotion is automated on social media, it is still important to get online yourself. Nothing can replace that personal touch. Take time to respond to follower’s messages, comment on interesting posts and interact with your audience. An automated content schedule, entwined with an actual human being, will help successfully bring balance and success to your social media campaign. Where are the Premium WordPress Theme News and Updates?